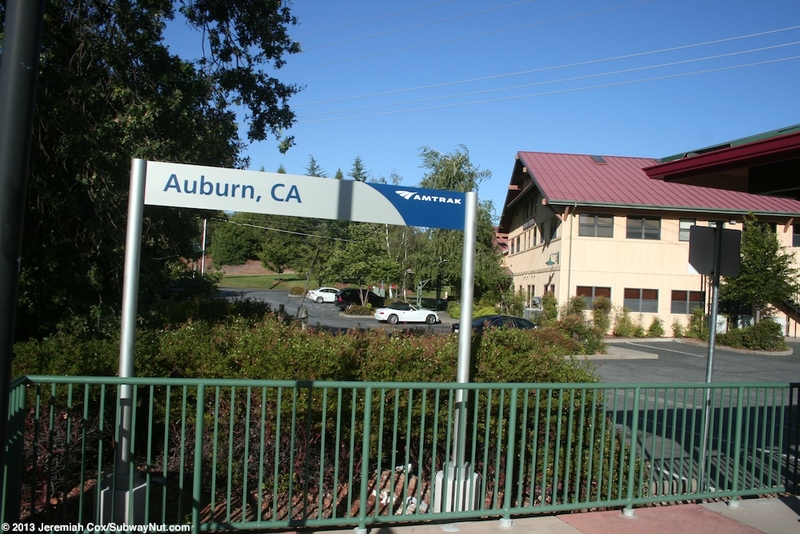 Auburn became a station stop on the Capitol Corridor when the one-daily train to and from Roseville was extended to Colfax stopping at Auburn on January 26, 1998. Ridership on the one daily train extended to Colfax at first was extremely low partially because of a terrible schedule with the evening train not arriving until 8:48pm. 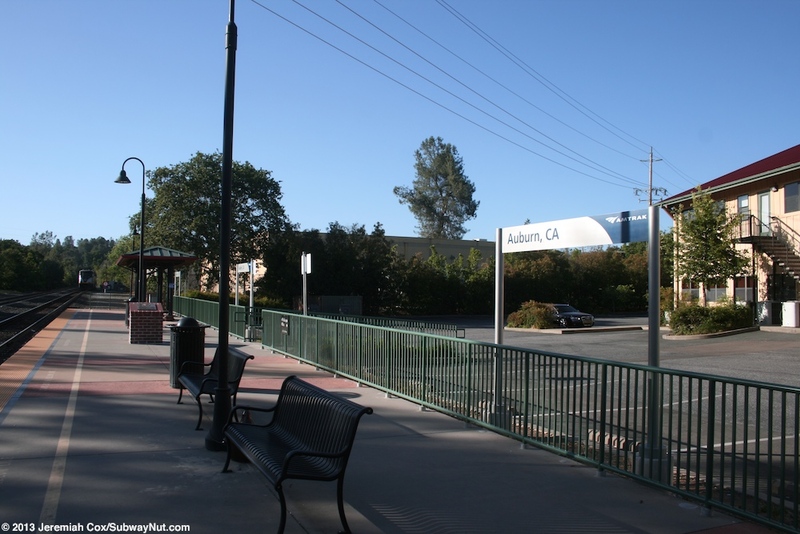 The State of California originally planned to discontinue the extension beyond Roseville, replacing all train service to Auburn with buses again effective with the October 1, 1999 timetable to the extent that this timetable was printed with the train pushed back to Roseville. 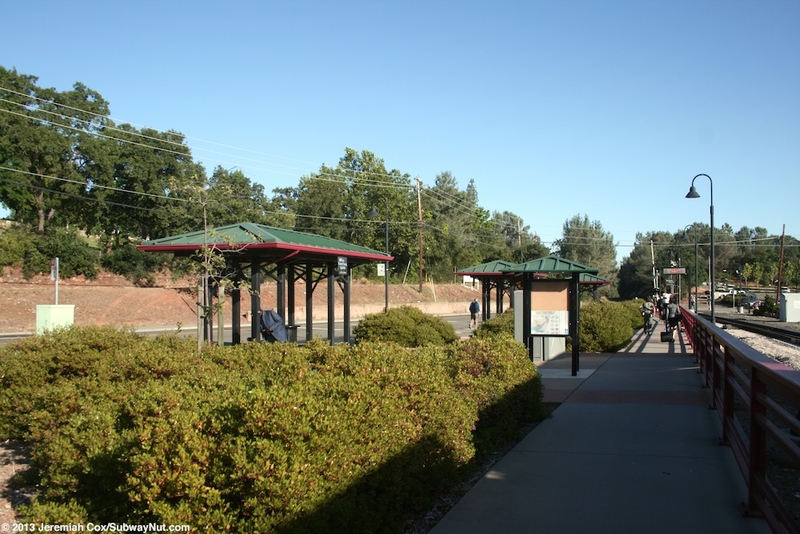 The extension to Colfax got a last minute reprieve so the service could be reexamined. 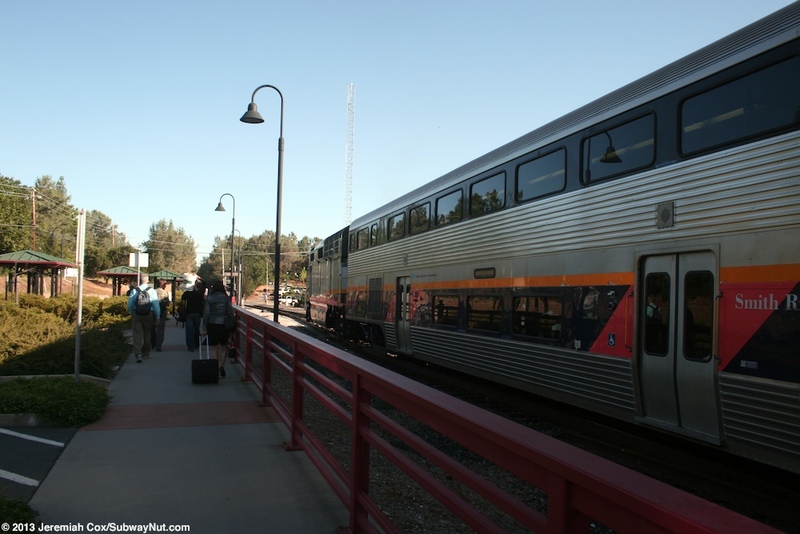 On February 13, just Colfax lost Capitol Corridor service (retaining the California Zephyr that Amtrak had wanted to discontinue the Colfax stop for and relented under community pressure). 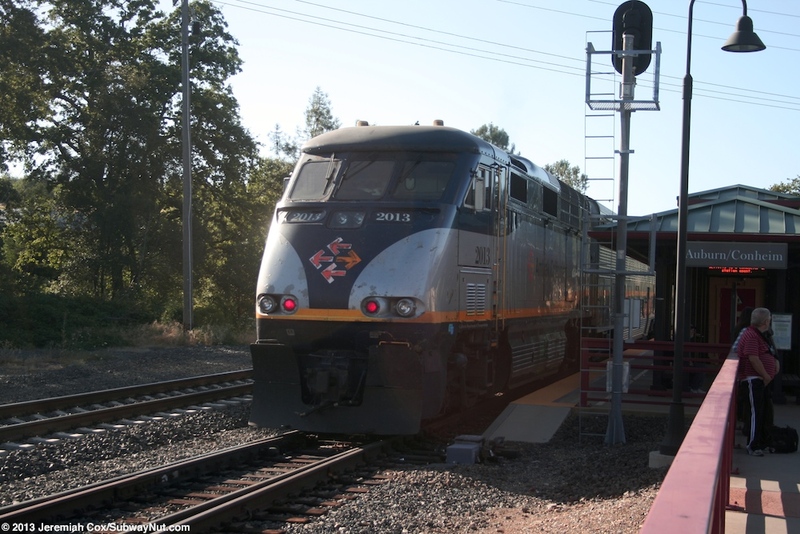 The caused Auburn became the terminus of the one daily Capitol Corridor train that is extended into the foothills of the Sierras for commuters from Sacramento and a new commuter oriented schedule was implimented (AM: Dp. ARN 6:30 to 7:37, PM Dp. SAC 5:28 Ar. ARN 6:40) that continues to this day, although now there is a more leisure oriented schedule on Weekends (Dp. ARN 8:05am, Ar. 8:33pm). 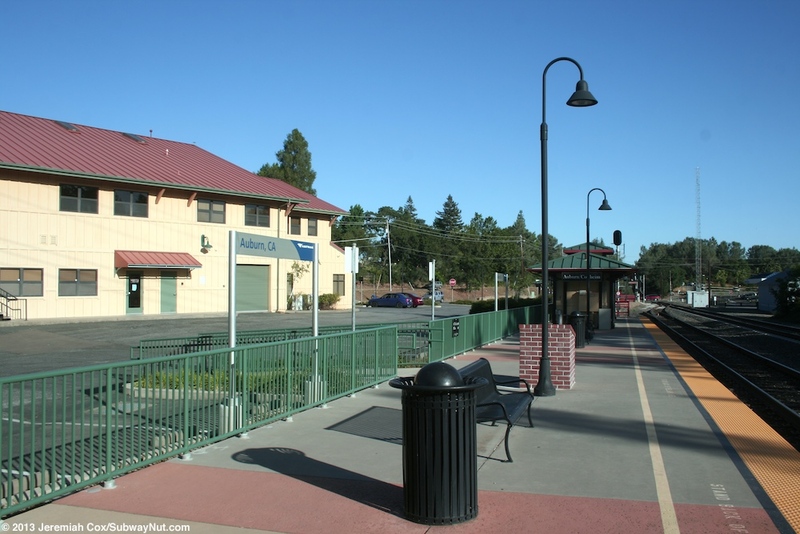 Service is supplemented at other hours by Amtrak Thruway Bus Connections and Pacer County Transit runs hourly relatively express bus service for $1.25 from the Auburn Station that connects with the Sacramento Light rail. The station situation in Auburn also has an interesting history. 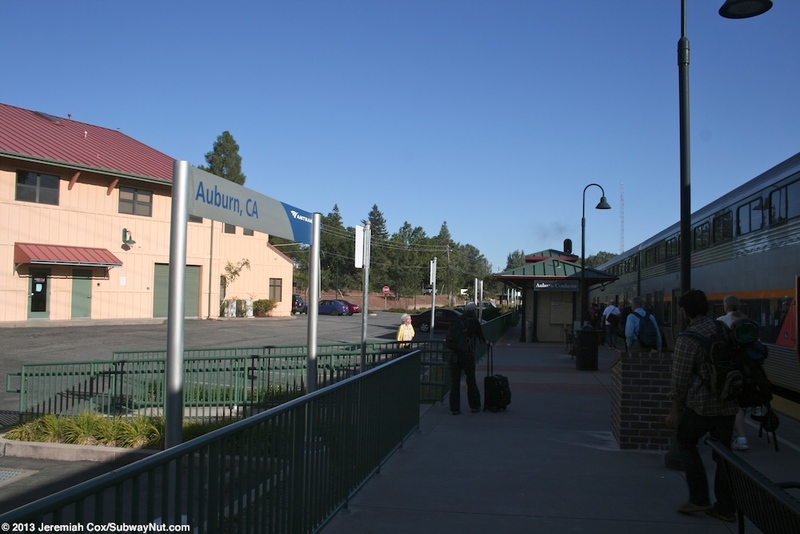 The town of Auburn has two different railroad lines running through it both used by the Union Pacific Railroad (one is the former Central Pacific, the other originally the Southern Pacific) In 1998 when the station first opened the two UP Lines operated under strict directional-running rules. The city actually originally had different platforms depending upon if you were Sacramento-bound or Colfax-bound. 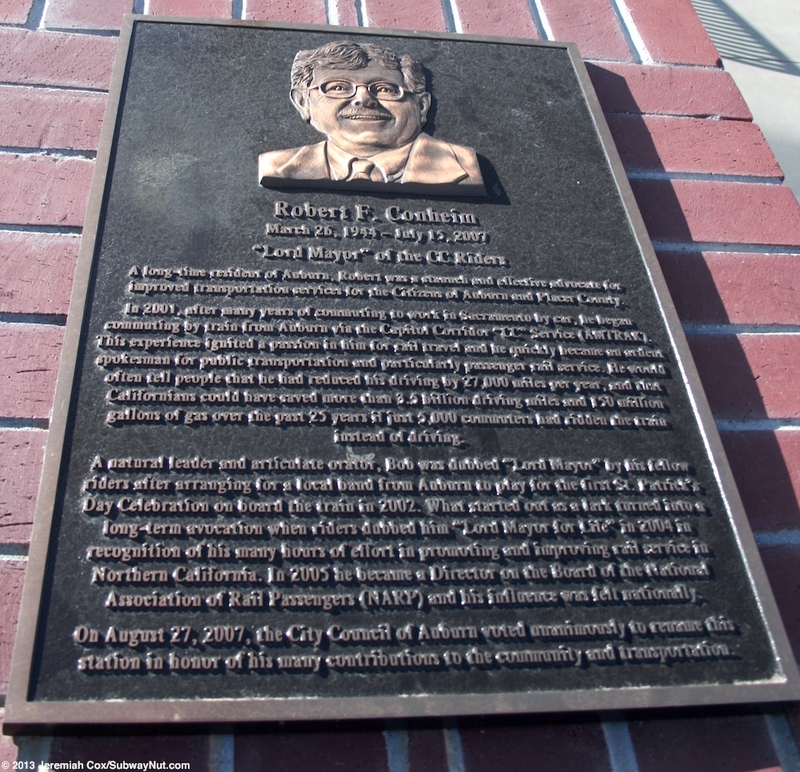 The May 1998 sums it up nicely with the daily Sacramento-bound train stopping at the Chamber of Commerce, Elm Avenue and Lincoln Way and the Colfax-bound train a mile away at about the location of todays station at Nevada Street and Fulweiler Avenue. 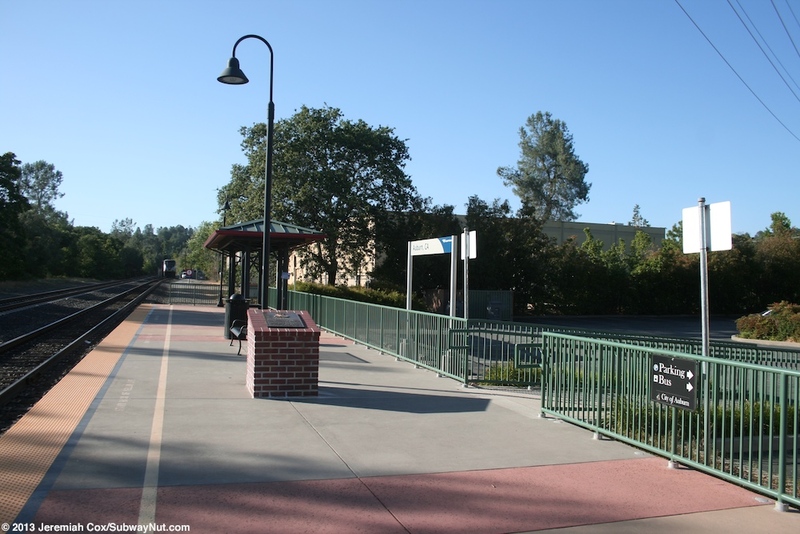 By the October 1998 timetable the directional-running issues were resolved with the Sacramento-bound train now stopping also at about today's current station location at Nevada Street and Fulweiler Avenue. The current modern platform and shelters were constructed in around 2003. 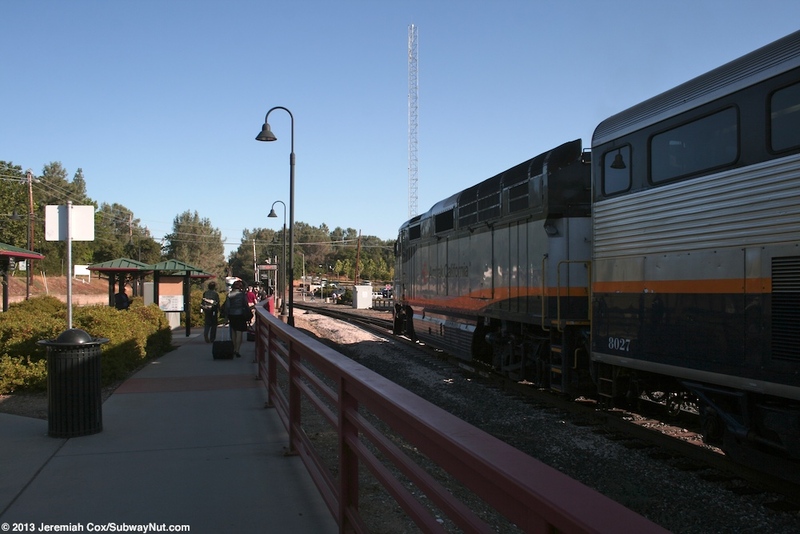 One final interesting fact about these dual railroad lines is only sometimes the California Zephyr passes the Auburn Station depending upon which of the two parallel lines the UP dispatcher decides to send the train between Colfax and Roseville on. 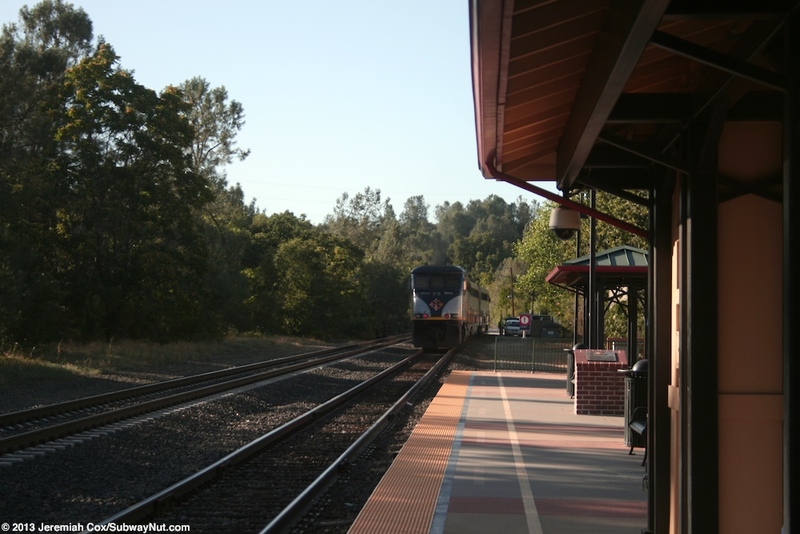 The Auburn platform is located on a siding just off of the single track main line. 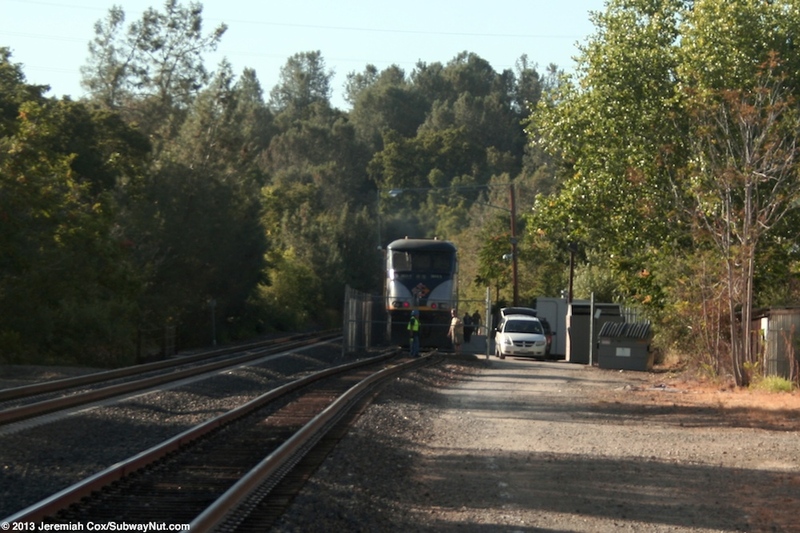 After stopping at the platform (that can accommodate just 2 &half; cars) on this siding trains continue running a short ways beyond it to a small fenced off layover area (including a gate crews need to open across the track) where crews park and secure the train for its overnight layover until its southbound return the next morning. This layover area has what looks like a former ground-level platform with a yellow line (Google Satellite Image). These photos from 2001 show a station near the current stop, it seems like the platform along the lay-up track behind some industrial areas might have been used while the current station and platform was under construction. 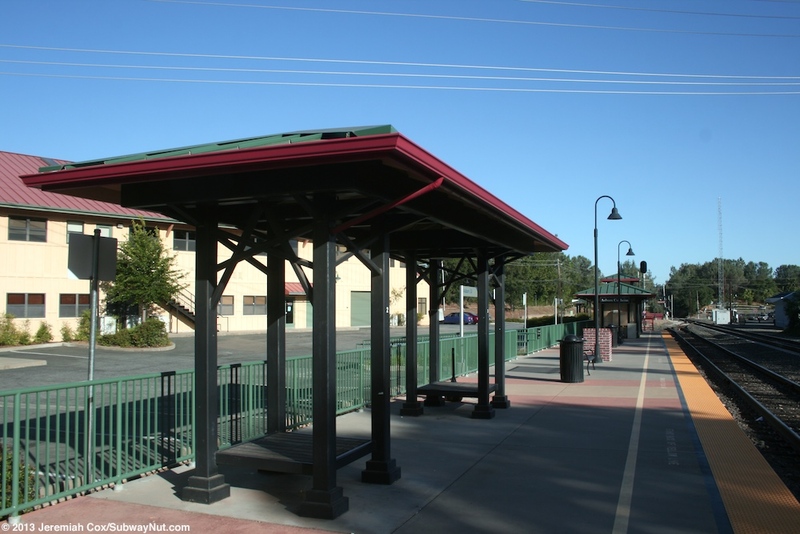 The station platform can accommodate 2 &half; rail cars. 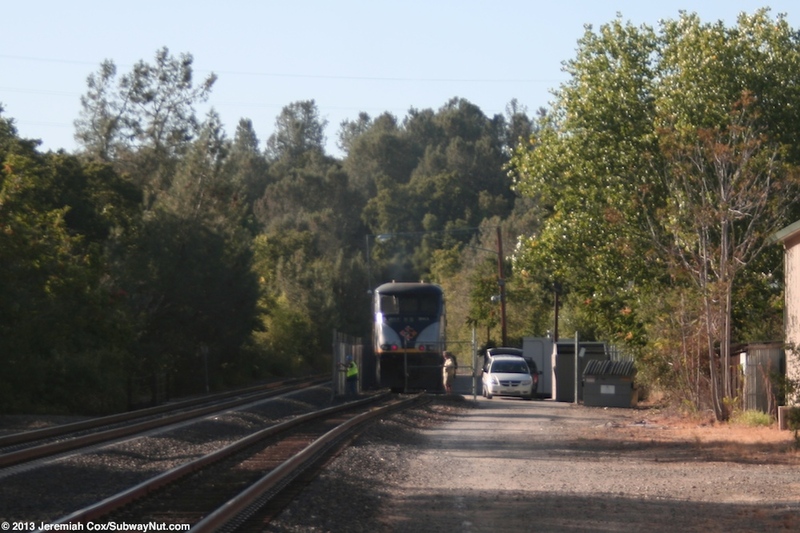 When I got off the evening Capitol Corridor Train here the first two cars fully opened and the next one had just its front door open, the last car of the 4 car train didn't reach the platform. The platform is simple but well designed. It has a modern yellow tactile warning strip, green fencing and black lammposts. At the northern end of the platform is a small black supports holding up a red and green roof canopy. At the southern end is a much larger canopy structure of the same design. Tucked inside here is a single restroom (open Monday-Friday 5:30am to 9:00pm, hope you don't have to go on a weekend), some backless benches, two Quik-Trak Machines for purchasing and receiving tickets and a blue passenger information sign. 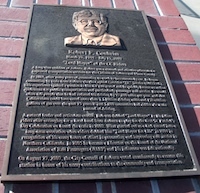 The middle of the platform has a plaque on some bricks dedicating the station to Robert F. Conheim 1944 to 2007, considered the "Lord Mayor" of the CC Riders (Capitol Corridor) since he began commuting by train from Auburn to Sacramento in 2001 and even became a national passenger rail advocate as director of the board of National Association of Railroad Passengers. 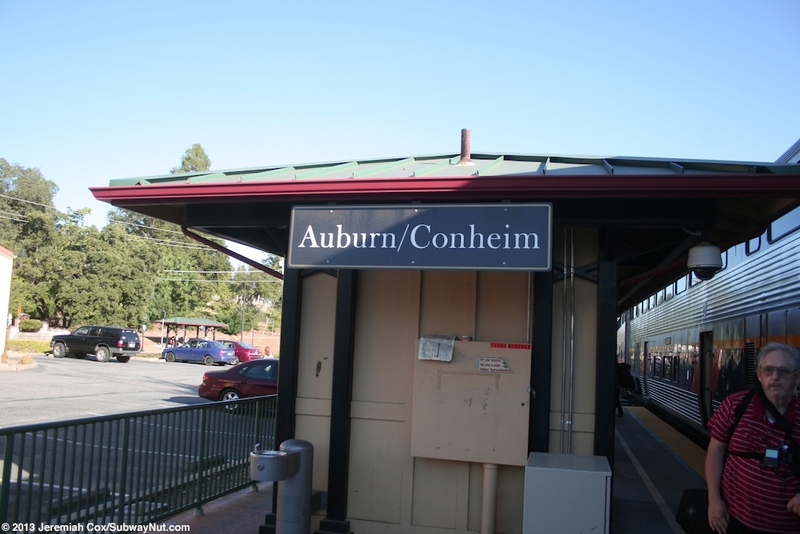 The two platform signs on each end of the platform canopy are black with a gold border and white text and say Auburn/Conheim. 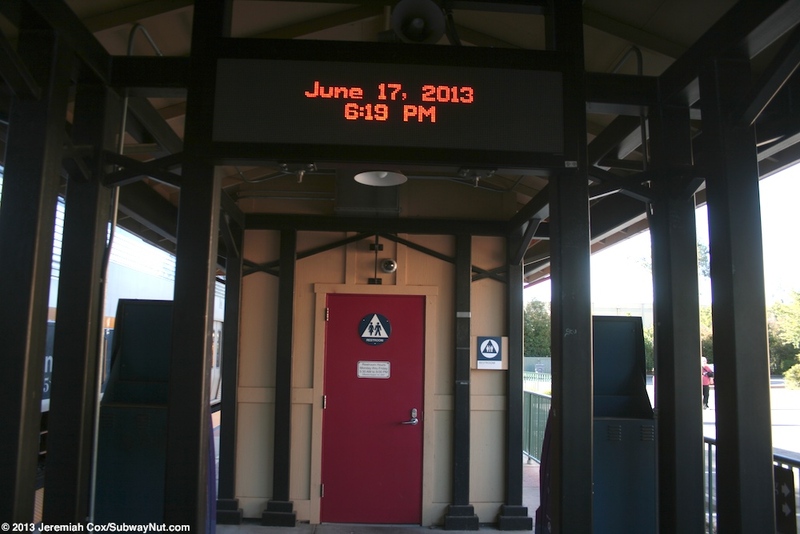 This sign style continues throughout the little transportation center to direct motorists and passengers to the various train and bus options. 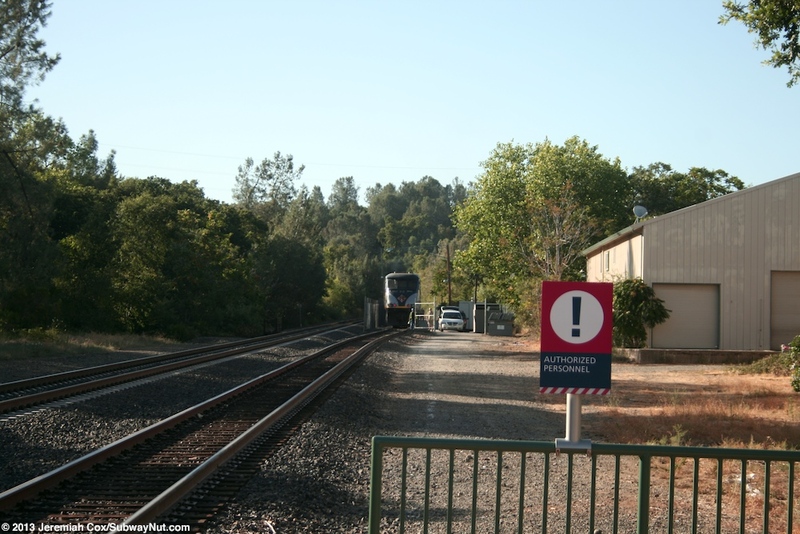 More recently Amtrak has installed a few more modern silver Auburn, CA signs behind the station platform and its slightly higher fencing. To leave the platform there is a central ramp with a slight decline. This leads down to a parking lot that isn't really for rail riders but tenants of the Nevada Station a two story commercial building near the station. 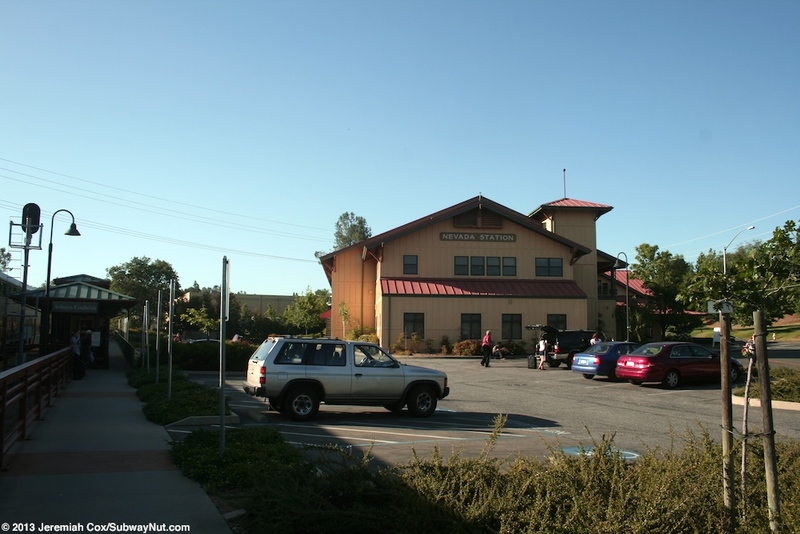 It only has the ADA parking spaces for rail riders and a car drop-off area. The second platform exit is at the southern end of the platform and is what most passenger uses. This leads to a walkway with a red fence between it and the tracks and leads along Blocker Drive, passing the station's main three bus stops (a forth is across the street). 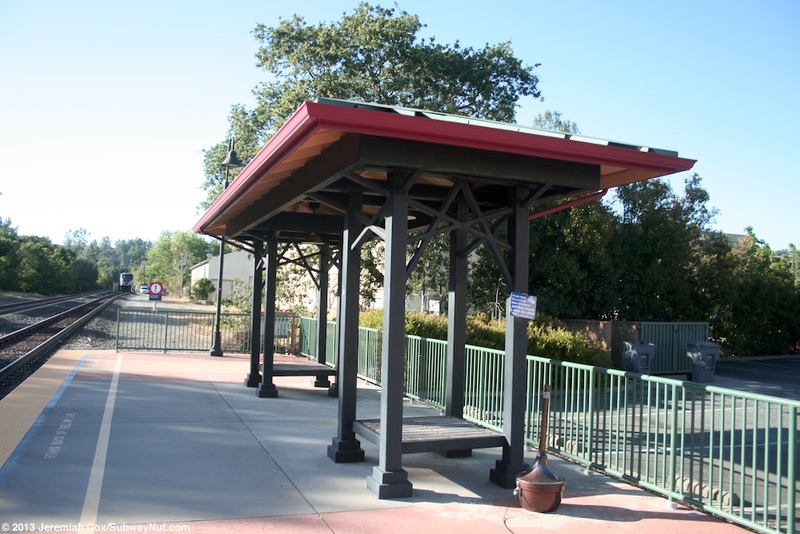 These all have shelters in the same style as those on the station platform. In this area is the switch for the stations siding onto the main line. South of this switch Blocker Drive curves to cross the tracks and the station's Park & Ride lot is located across this grade-crossing and extends south from Blocker Drive.